Educational research, including that of Maria Montessori, tells us that children learn best through real experiences, through active play, exploration, experimentation and discovery. At the London Preschool we acknowledge that this is true for older children but even more relevant for young children who are just beginning their journey of discovery and learning. We know that babies and toddlers learn through using their senses; taste, touch, smell, sight and hearing to process information. Their journey of sensory discovery starts pre-birth. Babies in utero are able to hear voices around them and can recognise music that they have heard often in utero, once they have been born for example. Post birth they rely on sensory stimulation and exploration to learn about the world around them. You will have watched the way young babies put every object that interests them into their mouths to taste them and then once they have come to know the taste of particular objects will cease to do this and will begin to explore the object using their hands to feel the properties of the object. They establish whether it is flat, smooth, is rounded etc. building a blueprint in their mind of the object so that they can pick an object up and know what it is even before they have a word for that object. At the London Preschool we provide exciting opportunities for our babies and toddlers to continue to learn through their senses both in our especially designed sensory rooms and in our base rooms. Activities are planned in base rooms to encourage young children to explore objects using their senses in different ways. For example we may lay out a collection of different size and shaped balls in baskets for babies to explore. The young babies will just mouth them, slightly older babies will feel them in their hands to feel the differences between them and then will come to realise that if they push them they roll! Each different type of ball will roll in a different way will be their next discovery. We might then place balls in paint so the children can roll them on paper to see their imprints. Next comes the realisation that they can bounce too, which leads to hours of experimentation with bouncing balls. All of this knowledge will help build an understanding of the properties of a ball so that when the child comes to play short tennis aged five or six all the knowledge they have built through their senses at an early age about balls will be used to direct a ball to be hit by a racket. Our well designed sensory rooms at the London Preschool are planned to provide children with a myriad of exciting sensory opportunities from lying on cosy mats for young babies watching the twinkling lights embedded in soft net that moves in the breeze, or watching the bubbles change colour in the bubble tubes to using the remote control when they are older to change the colours of the bubbles, learning about action and reaction. Scents of spring, summer, autumn or winter might waft through the sensory room, which may trigger a memory when out for a walk in the woods in winter. 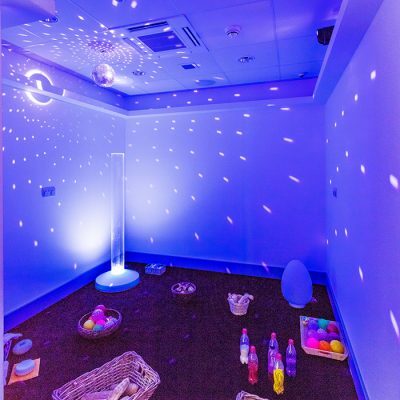 Babies will have the opportunity to watch reflections of a strobe ball on the ceiling and older children will be able to explore reflective objects in a darkened room, building an early understanding about light and dark. They will be encouraged to experience the feel of a wide range of different materials, experience listening to sounds including music and to make sounds with objects, toys and their bodies. Children will be able to explore real objects such as collections of shells, shiny objects and collections of wooden objects. All of these enjoyable sensory experiences, in a comfortable environment, enjoyed with supportive and responsive mentors will promote early learning and development and provide a solid foundation on which later learning can be built.